The point and click adventure genre is a large draw for me, principally because it was a substantial part of my childhood gaming foundation. Hours of adventuring with Guybrush Threepwood and Bobbin Threadbare have laid a deep grove in my gaming preferences. And so I found myself drawn in by the siren call of Burley Men at Sea at the PAX Prime Indie MegaBooth and had the opportunity to play their teaser demo. 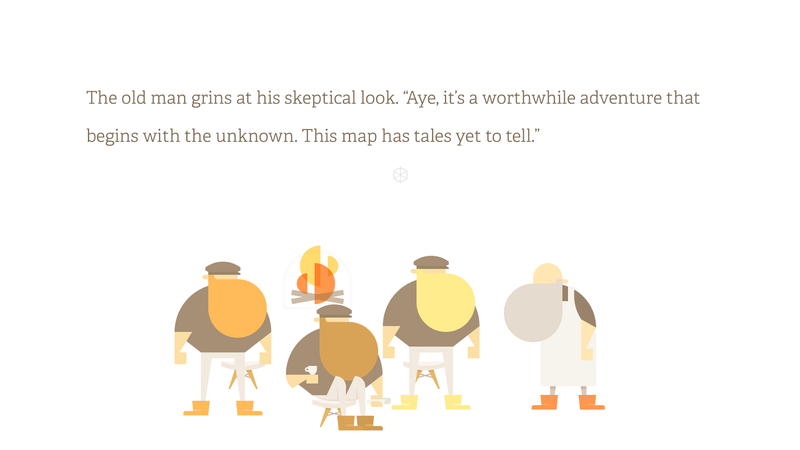 Burley Men at Sea is an undeniably charming adventure following the Brothers Beard, Brave Beard, Hasty Beard, and Steady Beard. You act as an assistive storyteller, guiding the trio of strapping young sailor men as they pursue a quest prompted by the discovery of a mysterious map. This is the second release from the husband and wife duo David and Brooke Condolora the creators behind indie developer Brain&Brain. The art style is brightly colored and simple, inspired by Scandinavian influences, rendered with real-time vector graphics. The characters do not lack appeal or expression but the art isn’t hampered by anything superfluous, which gives the task of guiding the brothers’ adventure more of the player’s focus. As I played I couldn’t help but feel as though I was reading a storybook adventure to my young daughters, a sensation that brings a lot of warm fuzzy feelings in tow. While playing David explained that Burly Men at Sea had a branching story, with the opportunity for distinct multiple play-throughs. Though the demo was brief, it was a surprisingly relaxing experience amid a bustling and intense convention hall. I am certainly hooked, and very much look forward to seeing the game in full when it is released. Which will hopefully be soon, as it was Greenlit on Steam just before PAX.